Rack Cards are a brilliant way to promote a business anywhere in the world! They are inexpensive to print and very cost effective to post, they can shape the heart of a advertising campaign. Every motel whether large or small must have a rack card, included on the rack card can be location, attractions, and room rates.The list of characteristics ought be refined and listed in order of significance to potential guests. In a rack card you’ll only be able to list five to eight depending on the space you require for area attractions, directions, a map, location details, and reservation directions.. 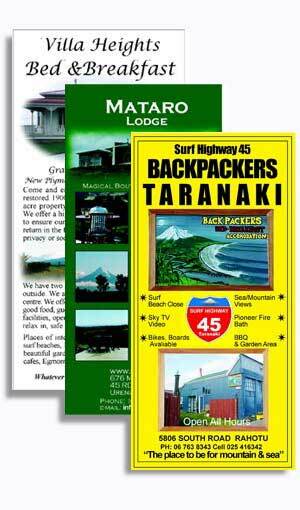 Rack Cards in New Zealand are commonly used to encourage tourism, and travel-related businesses or almost anything. Your cards will shine from the rest of the crowd with our clear, crisp printing. Double sided full color rack cards are one of our flagship products. You will be hard pushed to discover superior worth anywhere. (There are alot of printers who use coarse uncoated stock for the back side.) Our product is a dazzling four-color process on both sides with an aqueous layered finish. Wow, endorse your company without exceeding your budget. Printed on thick sturdy shiny board, so that it stands up in all stands. 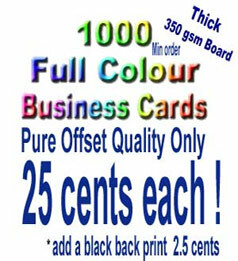 5000 Full Colour Double Sided Rack Cards New Price? If you would like further information or free samples of this great product please feel free to contact us. Delivery time on this product is approximately 12 -18 working days from approval of finished art work. The above pricing does not include Freight, Artwork or GST. It is for file supplied artwork to our specifications.